1/8 Scale There are 3 products. 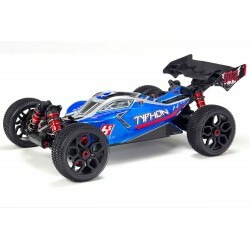 Whether you take it to the racetrack or a mud-covered course, the TYPHON is the buggy that means business. The BLX4074 2050kV brushless motor and BLX185 ESC deliver blistering power, especially when they're paired with two 3S LiPo batteries. dBoots Exabyte tires on multi split-spoke wheels get you where you need to go, regardless of condition. Unleash four beast modes, on-the-fly. The NERO 6S BLX is a 6S LiPo-ready 4WD 1/8 scale Monster Truck that is primed for aggressive blasting in all environments. You can easily access Smart Diff Technology with the optional (Electronic Diff Controller) Diff Brain system, all activated from a premium-quality TACTIC TTX-300 2.4Ghz radio transmitter.